The Raheem Sterling saga has attracted the remainder of England’s leading clubs to Liverpool’s door with enquiries, but it seems Arsenal are the first to make concrete plans to secure the contract rebel’s services this summer. According to the Daily Star, the Gunners will offer both £20m and former right-wing prodigy Theo Walcott to the Merseyside club in order to land their man. Sterling’s future at Anfield is under intense scrutiny as rumours of his astronomic wage demands and silverware ambitions continue to dominate the column inches. Meanwhile, Walcott has suffered an injury ravaged season that has seen Alexis Sanchez and Danny Welbeck flank Olivier Giroud in the first-choice front three for Arsene Wenger. 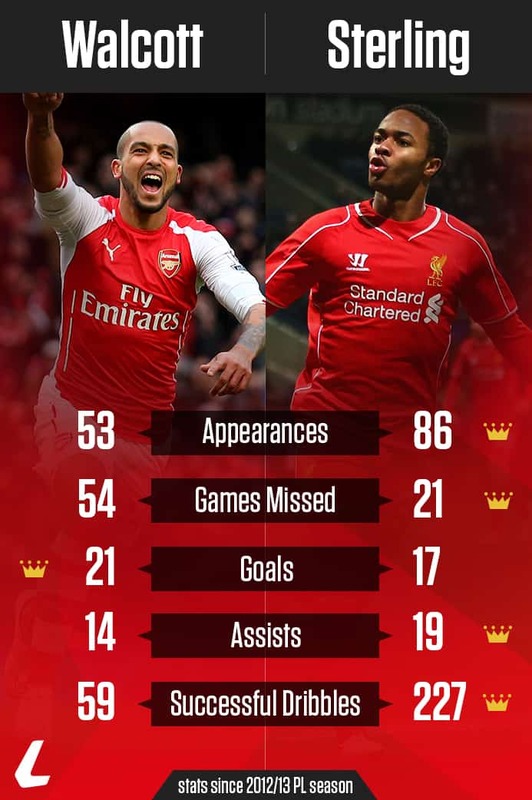 Although Sterling wins out in four of the five categories, Walcott’s injury problems play a huge part in that. In terms of the stats that matter, the Arsenal man still has more Premier League goals than his younger counterpart despite all that time on the sidelines, indicating just how wasteful Sterling is in front of goal. Considering Brendan Rodgers would inherit a more reliable source of goals and £20m to reinvest in his squad, it certainly seems that it’s the Reds who would end up flush from the swap.